If you are using disk partitions or drives in Windows Explorer and you may not want your friends to access your files and folders from those Windows 8 Drives. 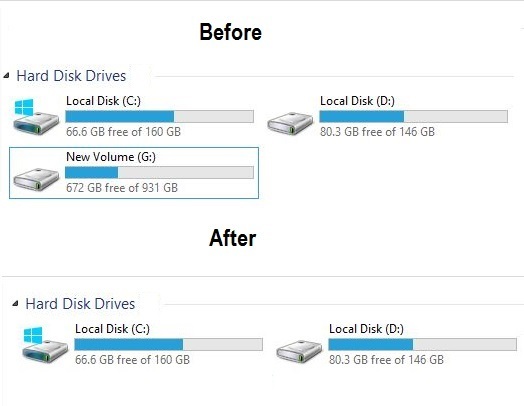 So this trick will help you to Hide Disk Drives in Windows 8 Computer. This way you can protect all your files and folder on your Windows Computer. NoDrives Manager is small app which gives you the option to hide any drive from your Windows PC, this can also be used for hiding the CD or DVD drives attached to your computer. So with this free application you can save all you private folder on that drive and hide that partition or drive from your friends and family members, but it doesn’t mean erasing any data or deleting the volume. So let’s see how to implement this trick on your Windows 8 PC. It is quite easy, just follow steps one by one to make it possible. Step 1. 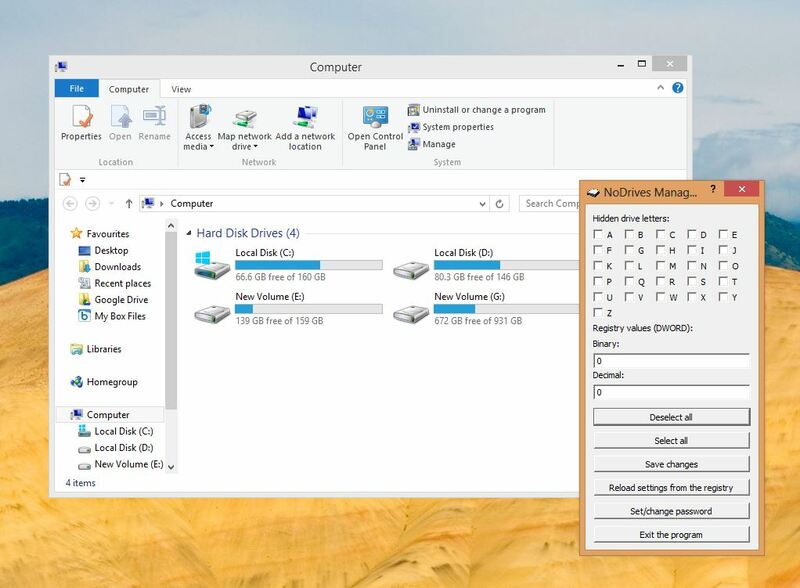 Download No Drives Manager on your Windows PC and install it to hide the drive and disks on your PC. Step 2. Open the NoDrives utility and you can see the lists of the drive of your PC. The interface is very intuitive and easy to use. From here you have to select the drive name which you want to hide from Windows Explorer. Step 3. From the app screen select the drive and hit the save button from the application settings. From here you can also Hide your CD and DVD drives. Select the drive name and hit the save button. Step 4. Now restart your PC to apply these change on your Windows PC, After that the selected drives will no longer be available inside Windows Explorer. Now the drive is not visible on your computer screen, but advanced users may still access the drive and its files through the Command Prompt Window. Step 5. If you want to see the drive again on your my Computer screen, open the app again and deselect the drive from the application and hit the save button. After you log out and back in again your drive will be magically restored. We tested this application on our Windows 8 64bit pc and it works smoothly. NoDrives Manager is freeware and works on Windows XP, Windows XP x64 Edition, Windows Vista (32 and 64 bit), Windows 7 (32 and 64 bit) And Windows 8.